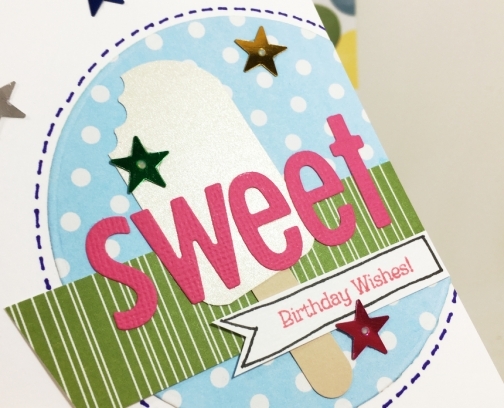 Send SWEET birthday wishes with this vanilla ice cream Popsicle birthday card, complete with envelope. I die cut and placed each letter to spell "sweet" and stamped the birthday wishes. The vanilla Popsicle is offset by a blue and green background and shiny star-shaped sequins. 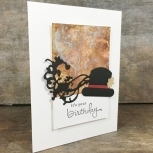 This all ages, unisex card works perfectly for him or for her, for a child or for an adult. The inside of this card is blank. This hand made greeting card measures 4.25 by 5.5 inches (roughly 10.75 by 14 cm) and comes with a plain, white envelope. This birthday card comes in a resealable, cellophane sleeve. You can mail the card in the envelope in this sleeve to help protect from rainy weather! A shop label, signature and creation date appears on the back of this birthday greeting card.